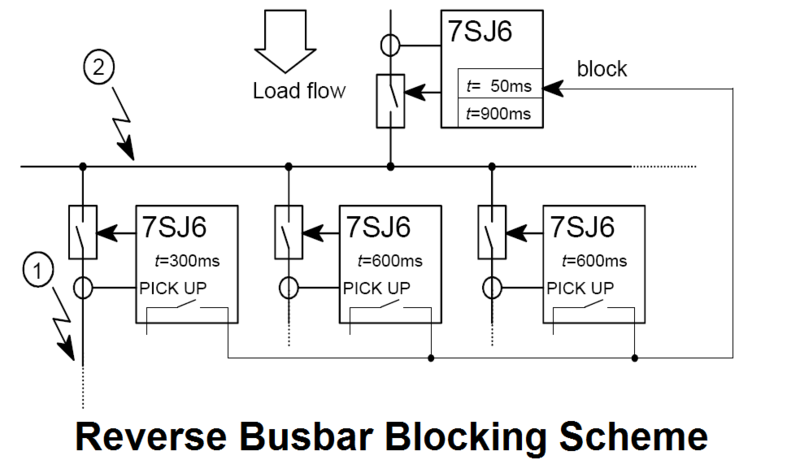 The reverse busbar protection is a cost-effective solution for accelerated clearance of busbar faults in distribution systems. It can only be applied on single busbars with a fixed direction of power-flow and fault current flow. 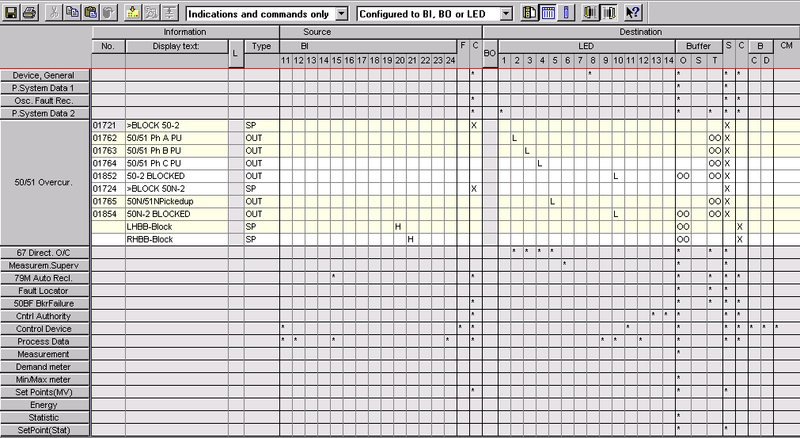 In picture 3, a typical application is shown. For this application, the protection device on the incoming bay (usually the transformer bay) will be provided with blocking signals from the outgoing bays (the feeder bays). 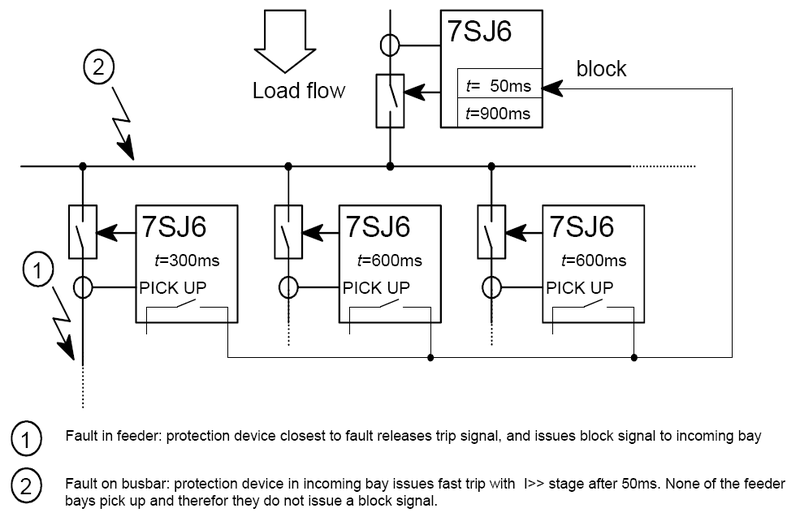 If one of the outgoing bays (feeder bays) detects a fault, (pick-up signal), this bay must route a blocking signal to the protection on the incoming bay. 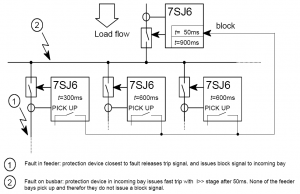 This blocking signal prevents fast tripping of the incoming bay (I>> stage). The block signal may only be present for one second. 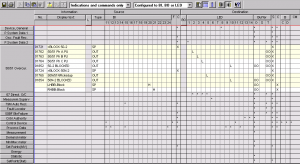 For this application a CFC-chart in the incoming bay is required. Although it is possible to allocate a signal from a binary input so that it provides the blocking of a protection stage it is not possible to allocate more than one binary input to directly block one protection stage (the reason being that if two binary inputs that provide the same blocking signal have a different state, the device logic would not know which of the two binary inputs should be used). The I>> stage in the in-comer will be blocked with the signal 1721 >Block 50-2., and the signal 1724 >Block 50N-2. These signals must be allocated with source CFC. (see picture 1). number, depending on other logic located in the same execution layer, PLC_BEARB). The OR gates must be first in the sequence, followed by the timer, negator and AND gate in turn.